It’s only once in a long while that you come across an album that turns you upside down. 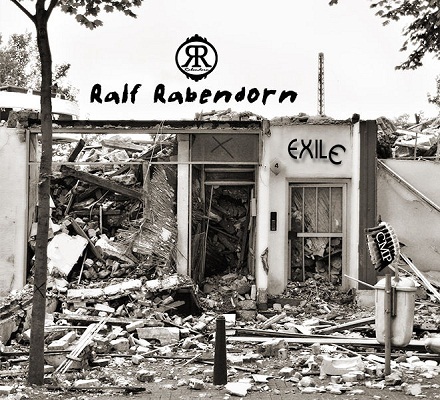 I think that ‘Exile’, coming from the deep, dark and sincere place, allowing its creator, Ralf Rabendorn, to attempt and draw the listener into the desert of the real. Is it really real? I don’t know, but what I do know is that Ralf’s voice, together with the shattered, painful music, brings out menacing, even if majestic voices of reason that wear the unsettling sounds like a crown of thorns and horns. Cinematic and nostalgic, ‘Exile’ gathers twisted, orchestrated music that paints a gloomy, apocalyptic world around Rabendorn’s voice, who sounds like an all knowing narrator who tells you the inevitable tale you need to hear just before the last curtain is being pulled down on this world. Not to take anything from the rest of the album, I think that ‘Decoy’ is the most powerful and percise song on this great work, feeling like a refreshing requiem to our oh so tiring existence. The end is near, my friends. The end is near, and this music is more than a fine choice to dress this closure with. This is beautiful.